I have been interested in Freedom Planet since I played the demo on my Wii U. Despite me not being that great at Sonic games, there was something quite appealing about this game which patterned itself after the classic series. I was planning on buying the full version of Freedom Planet on my Wii U, but then I started hearing concerning stories about how well the game ran on the console. Later on, I resisted playing it on Steam, since I wasn’t confident that my laptop at the time would have been able to keep up with the fast paced adventure. Just when I thought all hope of me getting into the game was lost, they announced it was coming to the Switch. After playing the demo at E3, I knew I was going to play the game, and thanks to receiving a review copy, I ended up with an opportunity to review it. 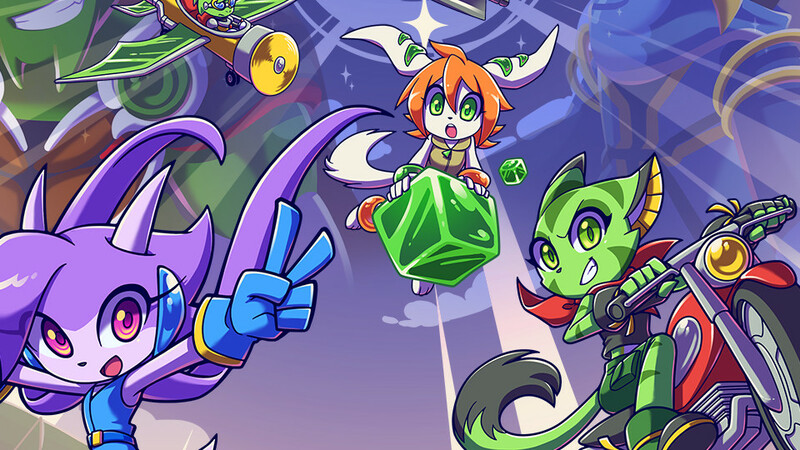 The question is, was Freedom Planet worth the wait? Earlier I mentioned that Freedom Planet is loosely based off Sonic the Hedgehog, which isn’t exactly a secret. What surprised me more were when I saw similarities to games from Treasure’s body of work, especially one of my favorites, Mischief Makers. 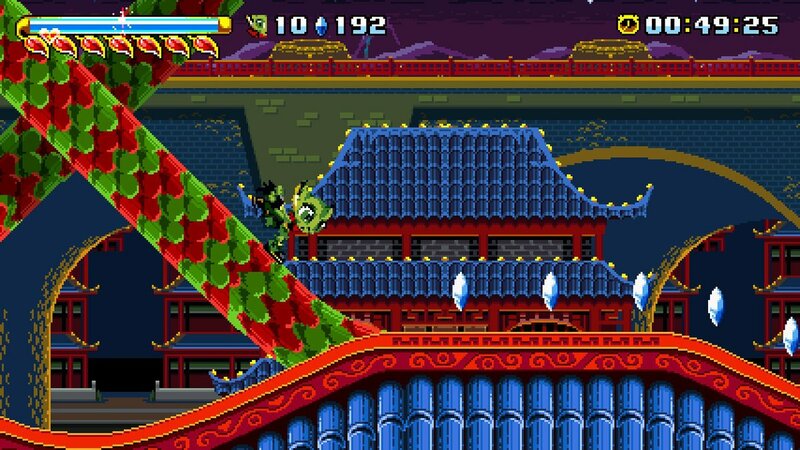 Somehow, Freedom Planet manages to be a fusion of the speed and platforming of Sonic with the madcap boss fights just as great as those from Treasure’s fantastic lineup. As if that wasn’t enough, the entire experience is like a delightful cartoon with lots of charming characters, plenty of banter and just enough menace to keep things interesting. While I’d not go so far as to say the plot is intricately crafted, it’s still quite fun, and gives plenty of reasons to play through with multiple characters to see all the twists and turns, depending on your hero. For myself personally, I played through the entire game with Carol, since her wall climbing helped me when my speed platforming skills weren’t enough. It also doesn’t hurt she can ride a motorcycle, double jump and has a special attack with strategic invincibility frames. The fact she’s a spunky green cat girl was just icing on the cake. The plot revolves around the Kingdom Stone, which supplies energy to the entire world of Avalice. It’s fading, and as it does civil war has broken out between the 3 kingdoms of Shuigang, Shang Mu and Shang Tu for control of the artifact. To make matters worse, a sinister figure is manipulating events from the shadows. After picking your hero from Lilac, Carol or Milla, your job is to discover the truth and save the day. Each stage is comprised of multiple segments, and is usually peppered with minibosses and one giant main boss. While you can certainly rush through stages, zipping around loop-the-loops, rocketing forward on conveyors and hopping onto moving platforms, if you peek in hidden corners you’re bound to find helpful items like temporary shields, gems and health. I tend to be very particular and deliberate in my pace, so I spent perhaps more time than absolutely necessary going down many dead ends. The upside was this usually provided enough gems to get plenty of extra lives, which became quite important against the challenging bosses in the game. 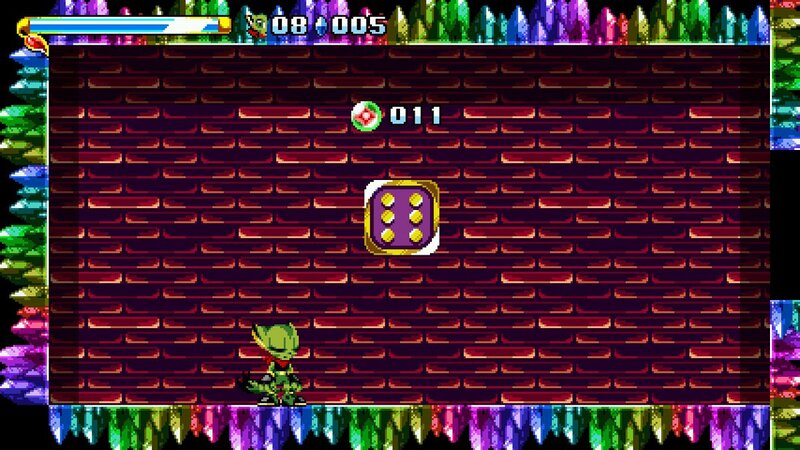 Simply put, the bosses in Freedom Planet are as colorful as they are challenging. There’s an enormous range, from giant metal praying mantises to massive flying mechs and even a crown prince riding a death peacock. Though they can seem overwhelming at first blush, by paying attention to their attack patterns, you’ll eventually get their timing down and come through victorious. Also helpful is that when bosses have multiple phases, there will often be checkpoints to prevent you from needing to fight through the entire battle all over again if you perish. Just keep in mind bigger isn’t necessarily tougher, as some of the hardest fights in the game are when you face bosses outside of their diabolical machines. Special note goes to Serpentine, whose battle in Jade Creek was one of the most irritating in the whole game. That said, there’s no boss fight I didn’t enjoy, some just required more patience to get past than others. One thing I really appreciated about the game was how it constantly mixes up gameplay elements. Some stages will have puzzles to solve, such as manipulating switches to make platforms appear and others disappear, or finding keycards to open locked doors. Others will pit you against the clock, forcing you to escape a room before you run out of oxygen. One of my favorites had you board various airships and take them down, one by one. There’s even a special stage where you control a lone tank against an army of mechanical threats. Point being, you won’t get bored at all. I especially appreciated how there weren’t that many cheap gotcha moments, such as running into a bottomless pit or face-first into spikes, which are common pitfalls in the Sonic series. Perhaps smartest of all is how the game gives you the tools to play how you want. If you only care about the gameplay, you can play through Classic and skip all the plot. If you prefer a more complete experience, you can choose Adventure and get both plot and gameplay. Or if you’re a masochist, you can choose Time Attack and race against the clock. 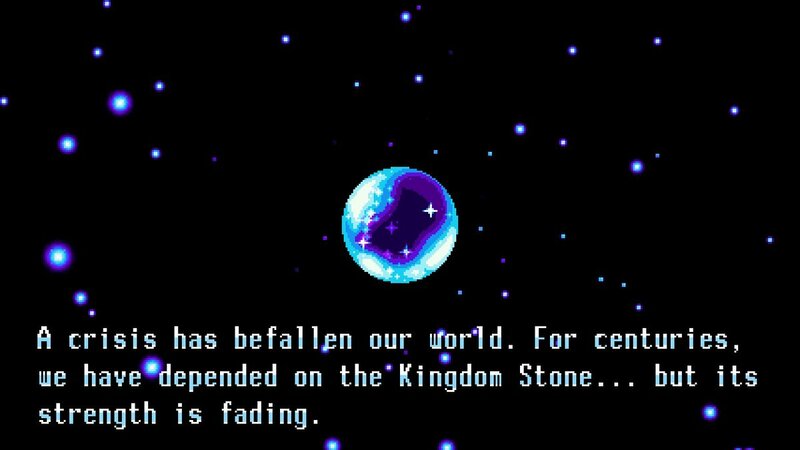 What’s perhaps best about Freedom Planet is it has a ton of replay value. Even though you can get through the main game pretty fast (my entire playthrough was about 4 hours), by playing through more than once you’ll unlock new characters. Playing through as different characters provides unique stages and bosses, as well as showing off more aspects of the story. If you want to perfect your speed, you can beat every stage in Time Attack, complete with training stages. And for the completionist, there’s tons of hidden cards that show off concept art, music tracks and sound effects. To say that Freedom Planet was worth the wait would be a massive understatement. I’m so glad I finally got a chance to get into this wonderful game on my Nintendo Switch. Not only does it play well, it is full of colorful SNES inspired visuals and has a pumping soundtrack that makes every stage fresh. It’s fun to play on the go or at home, and in many ways I feel it’s better than some of the games which inspired it. While it does get a bit difficult at times, it’s nothing most gamers can’t push through with a little patience. GalaxyTrail has done a fantastic job, and I can’t wait for the sequel. 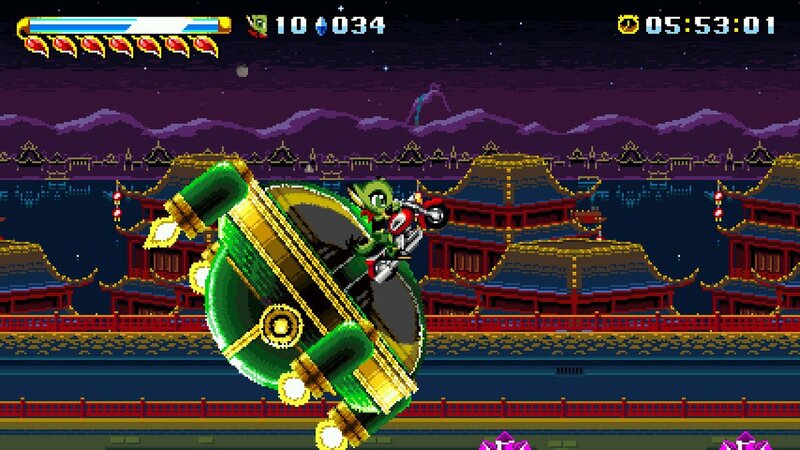 If you enjoy classic platformers with tons of style and substance, look no further than Freedom Planet. Green cat girls are the best girls!